In August 2016 I moved to Columbia, South Carolina, with my family (wife and son) to study at Columbia International University. A few months after our arrival we got an invitation to visit the Arsenal Hill Presbyterian Church. The church had a new pastor, Rev. Robert Turner. Due to his previous ministry experience in Turkey with Iranian and Iraqi refugees, Rev. Turner decided to embrace the refugees in Columbia and invited us to join hands in the ministry. 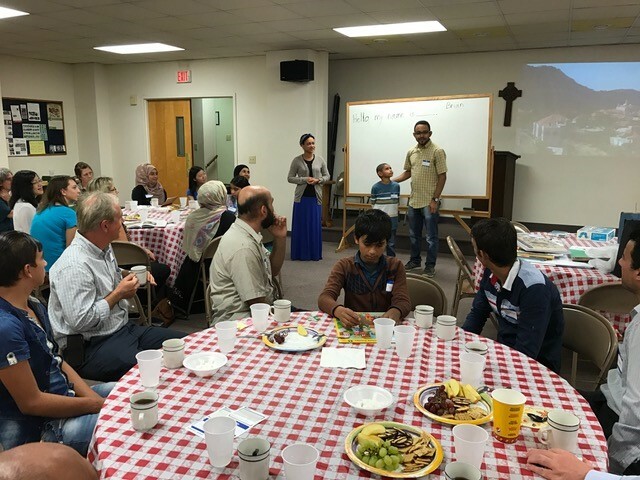 The church started the refugee ministry on October 30, 2016, embracing 29 Syrians from 4 different families. Later, Iraqi and Congolese refugees were added to the group, raising the number of refugees to over 40 people. The main service the church provides is free ESL (English as a Second Language) classes, covering cycles of six to nine weeks. The classes are on Sunday afternoons and serve men, women, boys (middle school and high school), girls (middle school and high school), and children (elementary and nursery). Our church is in the process of revitalization. As such, we only have 35 active members (the number of refugees we serve is higher than the number of church members). We know the task is much bigger than the resources we have, and as we look around us, we often feel like the disciples before the need of the great multitude: “We have here only five loaves of bread and two fish” (Matthew 14:17). The establishment of partnerships has been a key aspect of the work, not only providing volunteers, but also skilled workforce. Currently, most of our volunteers are students and staff from Columbia International University and University of South Carolina. As a refugee ministry, we have been vigilant to create a welcoming environment for our international friends. One crucial step in this regard was to adopt guidelines and training to help the volunteers to be sensitive to essential aspects of the cultures involved in the relationship with the refugees. At Arsenel Hill Presbyterian Church, we are expressing love for our international friends in different forms, such as respect, admiration, and recognition of their dignity and value as people created in the image of God. I had the opportunity to conduct interviews with some of the refugees in order to evaluate the services we are providing. Some of them told me that they are receiving more love from the Christians than from any other community in Columbia. Though we are small, as a church we feel God is using our lives to show love, plant seeds of hope, and provide access to the Good News to people who are having the opportunity to hear the gospel for the first time in their lives. Our refugee ministry has focused on practical ways to meet the needs of refugees as they make lots of effort to rebuild their lives in our midst. In addition to teaching English, we help with translation, explain aspects of the local culture, and introduce our new neighbors to life in our city. We provide transportation, make appointments, tutor, and help to connect to other community resources. In all of these practical ways we try to serve, we our building friendships. And, as we do so, we have opportunities to present the gospel. At the refugee ministry, my wife and I have been serving as ESL teachers. We are originally from Brazil and speak Portuguese as our mother tongue. Therefore, we are foreigners serving among foreigners. I have been telling my American friends that if we, as international students, can embrace and serve the refugees in America, I am sure there is something they can do as well. And we are supposed to do something because, regarding to the foreigner residing among us, the Almighty did not give us an option, but a mandate: “The foreigner residing among you must be treated as your native-born. Love them as yourself” (Leviticus 19:34). Jairo de Oliveira is a graduate student at Columbia International University in South Carolina. Originally from Brazil, Jairo has served as a missionary among displaced people in various countries in Africa before coming to study in the United States.